PARIS -- An assailant wielding a hammer attacked Paris police guarding Notre Dame Cathedral Tuesday, crying "This is for Syria" before being shot and wounded by officers outside one of France's most popular tourist sites, authorities said. 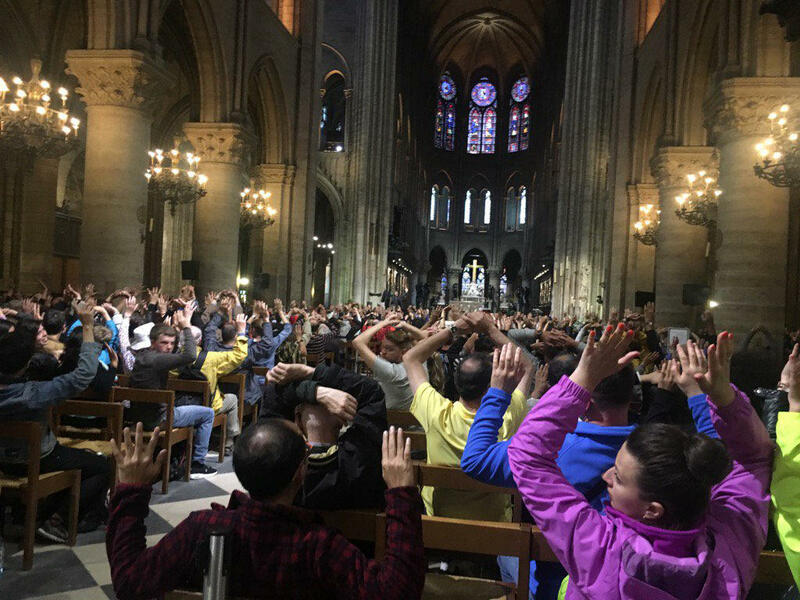 At least 600 people were blocked inside the iconic 12th century church while police first secured the streets around it, then combed the pews while visitors sat with their hands raised for the check. Others fled in panic from the sprawling esplanade outside the cathedral. The assault was the latest act of violence targeting security forces at high-profile sites in France, which remains under a state of emergency after a string of Islamic extremist attacks. CBS Radio News' Elaine Cobbe reports that the investigation has been handed over to the police's anti-terrorism unit, but the police also said there was no confirmation at this stage whether the incident was a terror attack. A man lies on the ground outside Notre Dame Cathedral after attacking police officers in Paris on Tue., June 6, 2017, in this picture provided to CBS News. Interior Minister Gerard Collomb told reporters that a police officer in a three-person patrol was lightly wounded in the attack, and the assailant was shot and wounded by a fellow officer. The attacker's condition was being evaluated. "A person came up behind the police officers, armed with a hammer, and started to hit the police officer," he said. The man cried, "This is for Syria!" but said nothing else indicating a motive or a link to extremist groups, Collomb said. No group immediately claimed responsibility, and Collomb said he appeared to have acted alone. A hammer and kitchen knives were found on the assailant, as well as documents suggesting he was an Algerian student, Collomb said. He said authorities were working to verify his identity. "We have passed from a very sophisticated terrorism to a terrorism where any instrument can be used for attacks," he said. The head of the Municipal Police Defense Union, Cedric Michel, said the attacker was about 40 years old. A police official from another union confirmed the age of 40 to The Associated Press. The second official asked to remain anonymous to discuss the investigation. The incident happened around 4:20 p.m. A large number of police cars descended on the Ile de Cite island in the Seine River, where the celebrated cathedral is located. Authorities told people to stay away from the area and some took refuge inside the cathedral. People inside Notre Dame, the nearby Sainte-Chappelle cathedral and area bars and cafes were told to stay inside while the police operation was underway. Mikey Kay, a retired wing commander for the British military, reported on CBSN that police sealed off a bridge to motor traffic near the cathedral, but it was open to pedestrian traffic for a time during the operation. Among the several hundred people ordered to remain inside the cathedral was former U.S. Ambassador to the United Nations Nancy Soderberg. She was admiring the church's stained glass windows with her niece when a French announcement came on urging those inside to stay calm as police dealt with an incident outside. "Frankly no one really paid attention to it," Soderberg told CBSN. "They only did it in French, and then I was like 'what was that?' because I speak French, and then about 20 minutes later they made it clear that no one could leave, and we had to go sit down." She snapped a photo of the dozens of people sitting in front of her with their hands raised as police checked the pews. A Colorado woman was among the hundreds in the cathedral. Kellyn Pot'Vin-Gorman, a tech executive from Westminster, told The Associated Press she was at the front of the line to enter the cathedral when she saw panicked people running in every direction Tuesday. Pot'Vin-Gorman said she heard three gunshots before seeing the attacker, dressed in a blue jacket and blue jeans, lying on the ground about 100 feet outside the cathedral. She said many ran toward a nearby subway station, but a crowd also pushed past her to try to get inside the cathedral. The 49-year-old said she was held with her husband and about 500 others inside the landmark, where many prayed and the mood was sober. Over an hour later, after authorities said police were attacked outside, visitors were told they would be evacuated in an orderly fashion. The Lord's Prayer was recited in English and French, Soderberg said. "People were extraordinarily calm, helping those who don't speak English translate," she said, adding that she felt safe but the situation was terrifying. They were being released Tuesday evening one by one after careful police searches. Neal Sanche and his wife, who were visiting from Canada, had just crossed the street from where a large group of police was stationed near the cathedral when they heard gunfire. "Two shots rang out, really quick shots, and then my wife had looked back towards the square," Sanche told CBSN. "People were running everywhere away from the area, and she saw police with guns trained down onto a figure on the ground." Lawrence Langner, a 73-year-old American visiting the neighborhood just across the Seine River from the cathedral, told the AP that he suddenly heard a commotion and two detonations like gunshots. Journalist David Metreau, who said his office overlooks the square that fronts Notre Dame, tweeted that there were two blasts that sounded like shots. Looking down from his office, he saw a man inert on the square. "The police didn't seem interested in him at the beginning," Metreau said. "I thought he was dead." Officers then checked the man's pulse, while medics eventually came and took him away on a stretcher. Sanche told CBSN that it was clear to him and his wife that the incident was over after the two shots. "It seemed to us that there was no immediate danger after that," he said. "My wife wanted to stay longer, but I talked her out of it. I figured that that was a bad idea." The attack came the day before new President Emmanuel Macron unveils his first efforts against terrorism, which Collomb called the president's top priority. The incident recalled two other attacks on soldiers providing security at prominent locations around Paris, one at the Louvre museum in February and one at Orly airport in March.